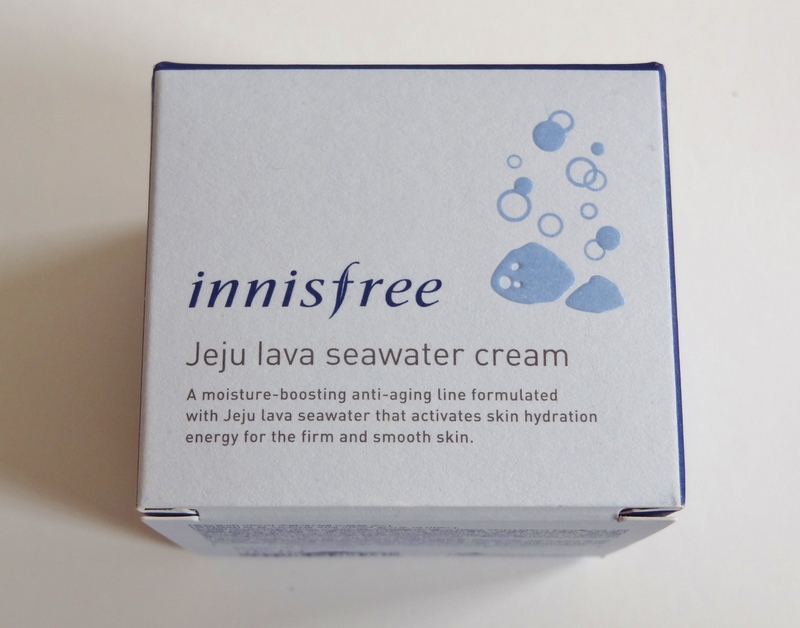 At the start of this year, Innisfree launched a new skincare line containing Jeju lava seawater which focuses on hydration and anti-aging. 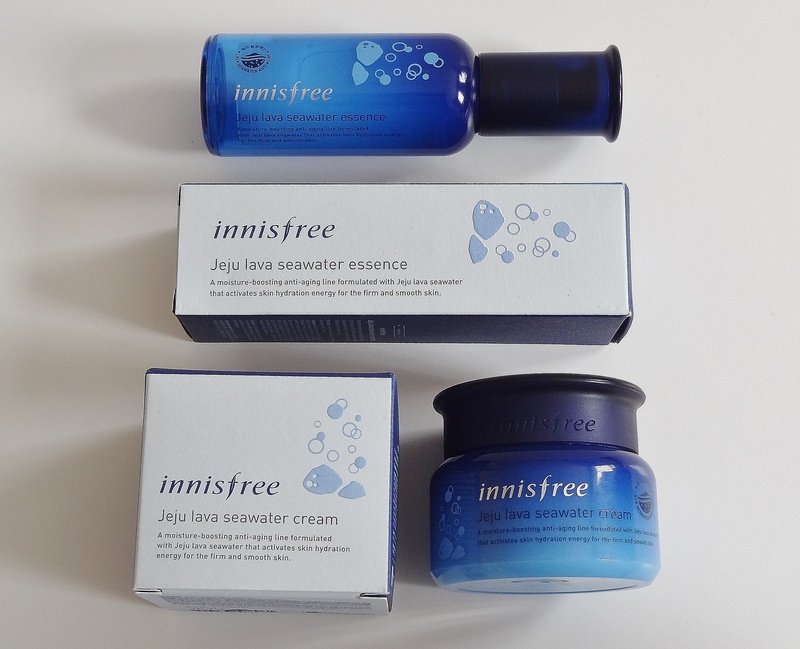 I was immediately drawn to the beautiful deep blue ocean packaging (as blue is my favourite colour), and Innisfree skincare always works really well for me so I was eager to try products from the new line. You might be thinking, what’s so great about seawater and what could possibly be so special about it that they’ve made an entire skincare range with it as their star ingredient. Afterall, its just water at the end of the day isn’t it? But actually seawater is incredibly rich in nutrients and minerals from all the marine life that lives down there. You’ve got seaweed, kelp, algae, which are all well known super foods that are also widely harnessed in skincare products for their skin benefits. The sea also contains marine collagen which is derived from fish scales and is a popular anti-ageing ingredient used in Japanese skincare. 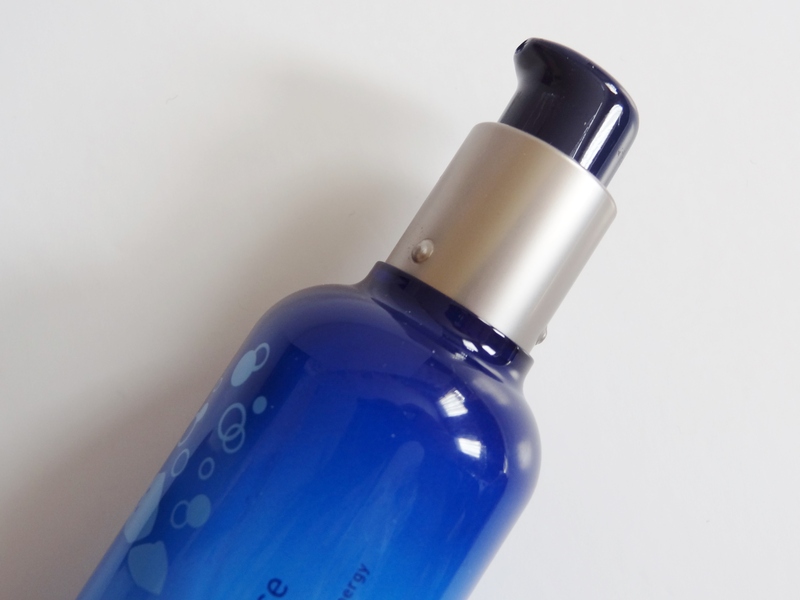 What makes this range a little different from other marine skincare is the source of its seawater. 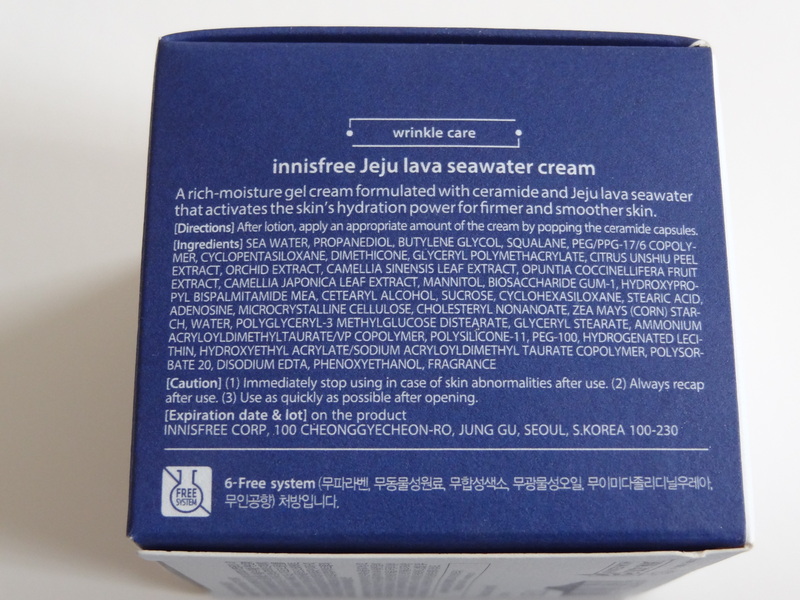 It’s also what makes it typically Innisfree – Jeju lava seawater. Jeju is basically a volcanic island off the coast of the Korean peninsular, known for its natural, unpolluted environment and cleanliness. Jeju was originally formed through volcanic eruptions and thus its volcanic rock, soil and lava still permeate throughout the island and its seawater. 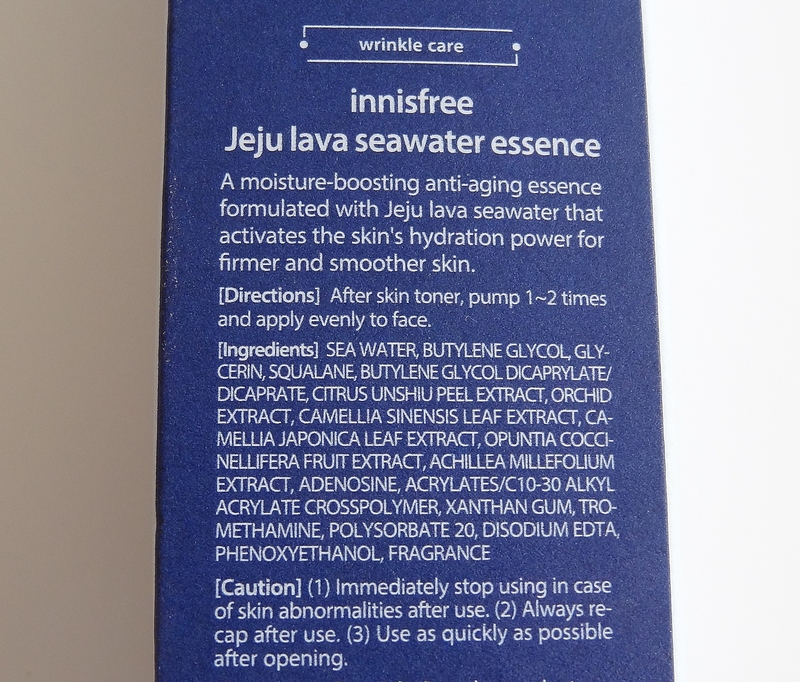 Now we’ve got that out the way, let’s jump into the review of the Jeju lava seawater essence and cream. 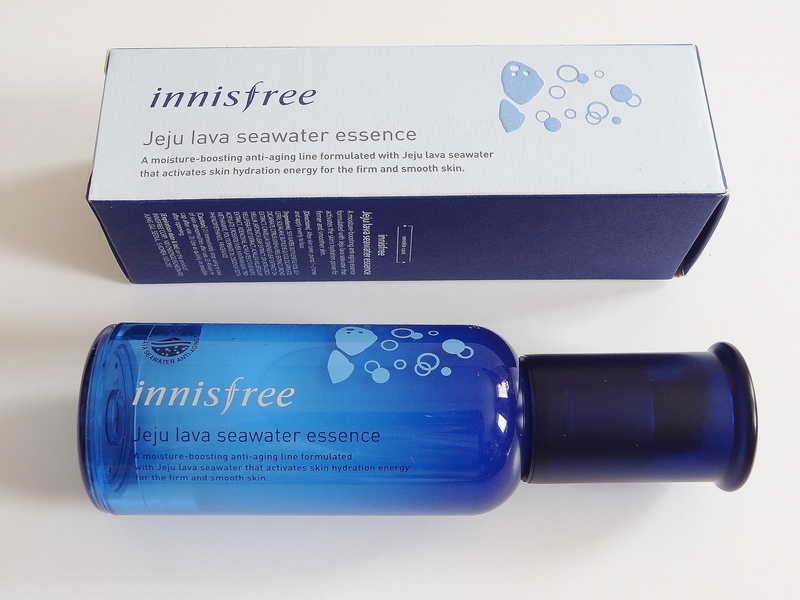 This essence claims to be a moisture-boosting anti-aging essence formulated with a whopping 84.5% of the Jeju lava seawater to provide firmer and smoother skin. This comes in a plastic pump bottle containing 50ml yet doesn’t feel cheap and I’m really loving the product design. What I appreciate most is that it has an airless pump; as you use the product, the inner pump mechanism moves upwards, which contains the remaining essence. So when you’re finished you’re left with a clean, transparent bottle and no wastage. I hate pump bottles where I can’t get the rest of the product out of it, but also, this means that the ingredients maintain their effectiveness and won’t break down through air exposure. As for the essence itself, I really enjoyed using this throughout summer. It is perfect for all skin types but especially oily -combo/normal skin because of how lightweight it is. 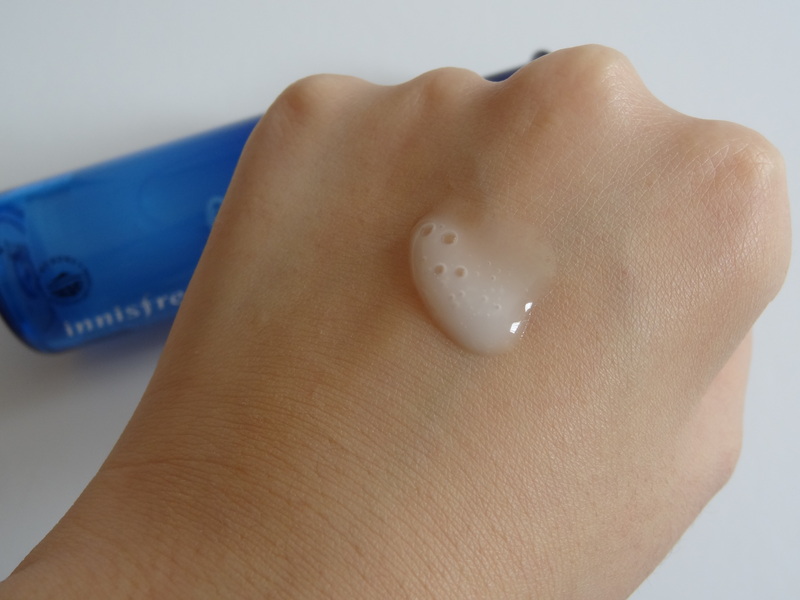 It has a very thin, watery consistency but still moisturising as an essence should be. I use about 2 pumps for my whole face and it glides so smoothly and softly over my skin as I massage it in. It absorbs super quickly, leaving my skin feeling instantly hydrated with no residue left behind. 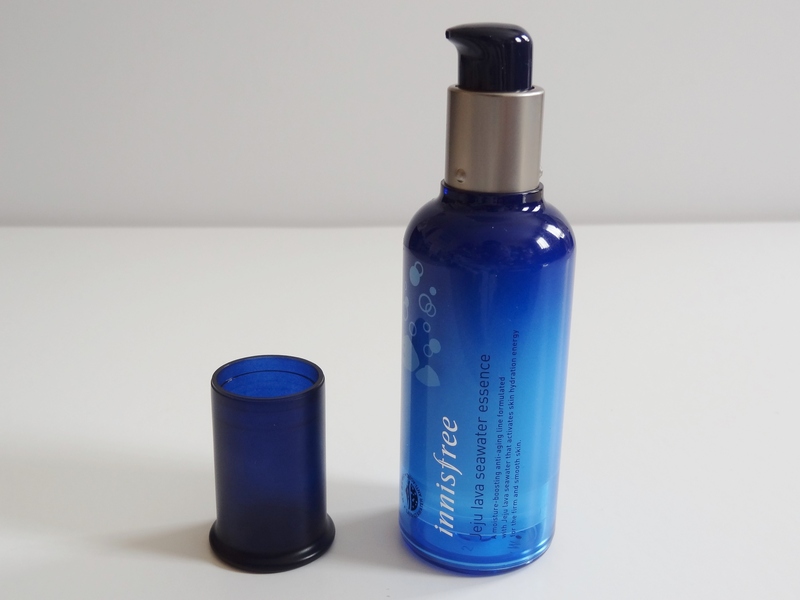 The smell is almost identical to the Innisfree Whitening Pore Eye Cream – ginger tea and herbal. 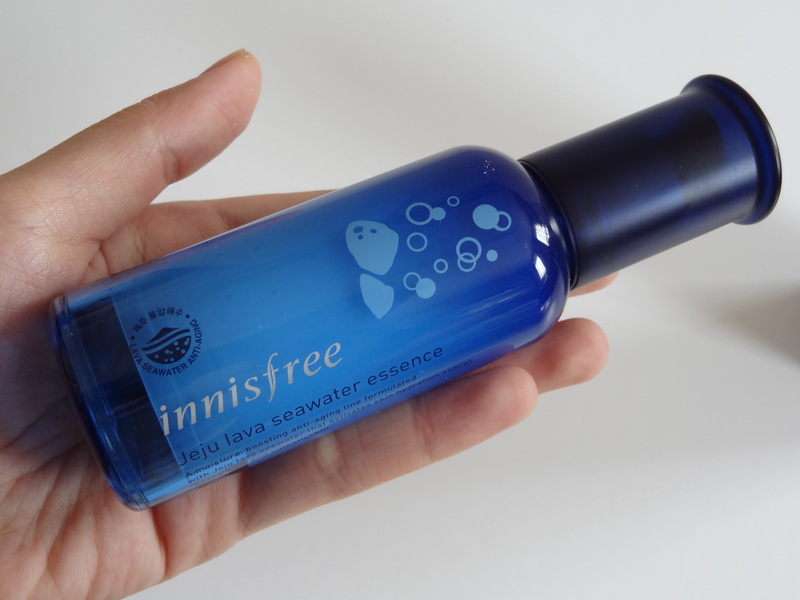 I actually prefer this much more over the Innisfree Green Tea Seed Serum because while it feels similarly lightweight, the lava essence feels more moisturising and my skin seems to look and feel better with it. I can’t however say that I noticed much in the way of anti-ageing but I don’t think it intends to work in the way that a heavy duty anti-ageing product would. It won’t do anything for existing fine lines and wrinkles (except temporarily plump the area), but I like to think with frequent use it wards off premature signs of ageing. This works well in conjunction with other skincare if you layer it for additional moisture, but is also great if you’re in a rush in the morning and just apply a minimal routine of toner, essence and moisturiser. In the summer, this was perfect for day and night and didn’t bog down my skin down. I probably wouldn’t rely on this in winter if only because I prefer something more moisturising to protect against the cold winds (though they do have a ‘deep essence’ which is a thicker consistency for dry skin), but I will definitely repurchase when Spring rolls around again. As much as I liked the essence, I loved the cream. It was perfect for the warmer months. It is described as a rich-moisture gel cream formulated with ceramide and 75.2% lava seawater to create firm and smooth skin. 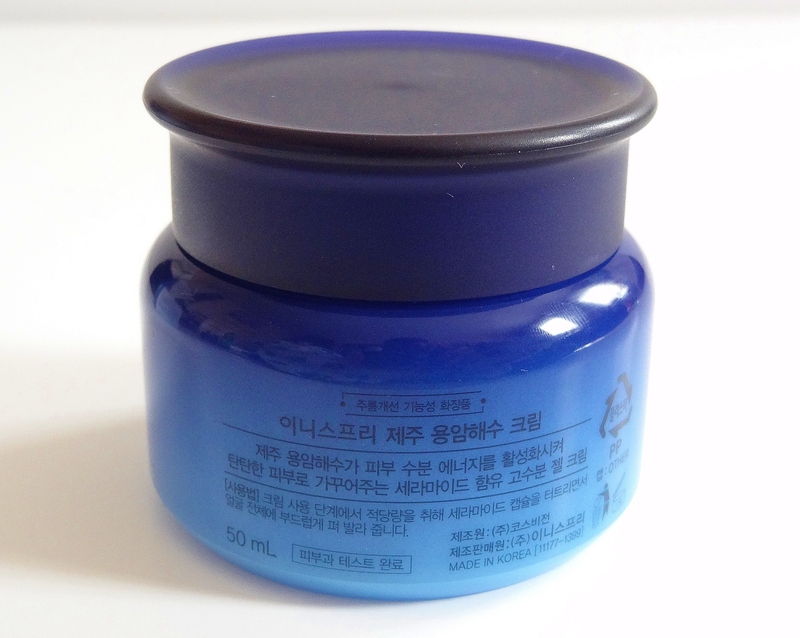 The cream comes in a 50ml plastic jar with screw top lid. I think the packaging for this is sooo pretty. The gradient blue just makes me happy looking at it. I really love how all the Innisfree skincare lines have their distinct colours to identify them but this is for sure my favourite. Unfortunately, like most Innisfree creams, this doesn’t come with a spatula. 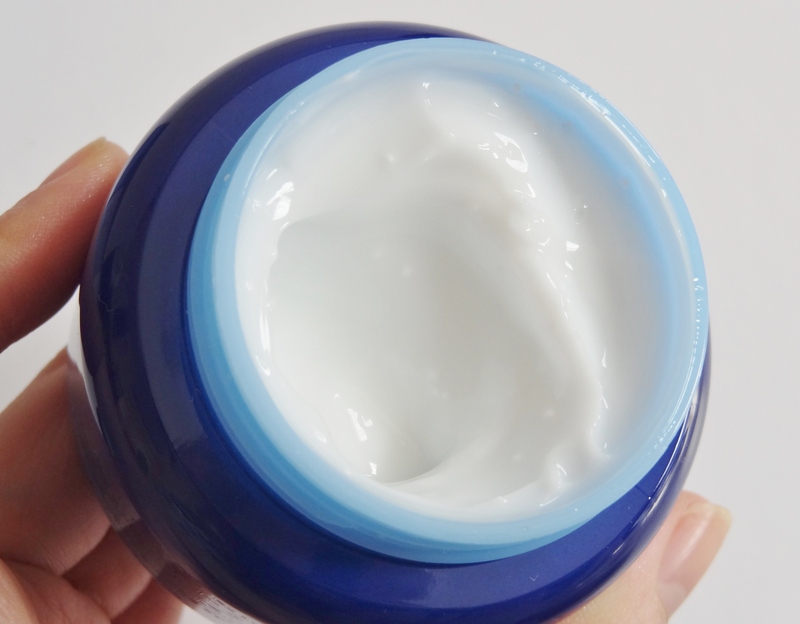 The cream isn’t really a ‘gel cream’ like how it’s described because I think of a more transparent, watery and jelly-like texture for gel creams. Inside are little white balls suspended in the cream (which reminds me of the amazing Green Tea Sleeping Pack), which are supposedly the ceramide capsules that burst and dissolve as you work it into your skin; I like this makes the cream a little more ‘exciting’ to use. Like the essence, I really enjoy the texture and consistency. 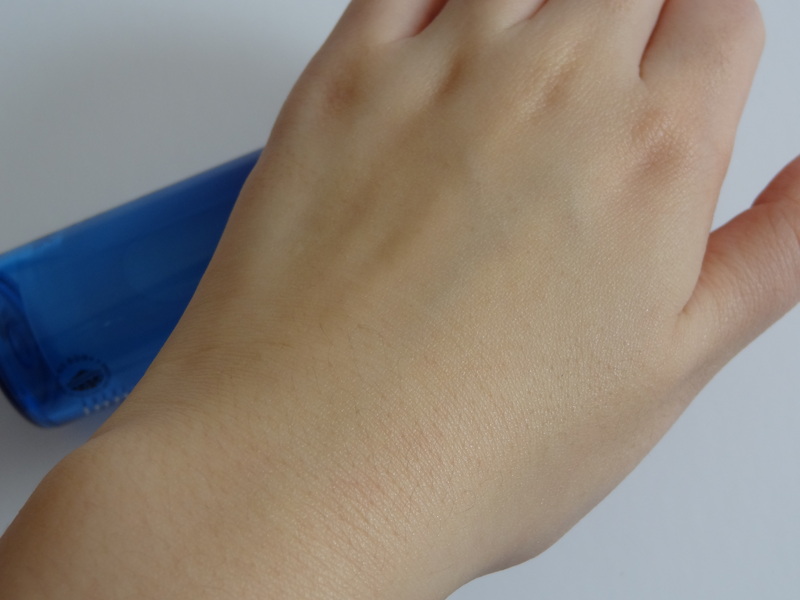 It has enough slip to glide on your skin smoothly and absorbs quickly without leaving an oily film behind; it just gives a soft and hydrated feeling. This again is perfect for the warmer seasons and one of my favourite day creams to use. I like to use this as my morning moisturiser because it feels hydrating enough without being too heavy under my makeup. It feels like its sinking into my skin rather than just evaporating lie a true gel cream sometimes feels like. Its the perfect middle ground between a gel that doesn’t provide enough moisture to last the day, and a more emollient cream that makes my skin feel heavier and greasier as the day wears on. In the summer my skin was leaning more on the normal-oily side and this didn’t make my skin any oilier but after a long 12 hour day, my skin would occasionally feel drier than I’d like. It does provide a good medium moisture level but its not sustained throughout the day and nor does it help alleviate dry or flaky skin. I would only recommend this to dry skin people for daytime summer use. For someone with normal skin like me, I dont think its moisturising enough for the nighttime. I prefer a lot more moisture during the night when it doesn’t matter how greasy or shiny I look, as long as I don’t wake up with dry skin. So if you’re looking for a good daytime moisturiser that is suitable for all skin types, hydrating but fast-absorbing when you’re aiming for a quick skincare routine, then this would be for you. 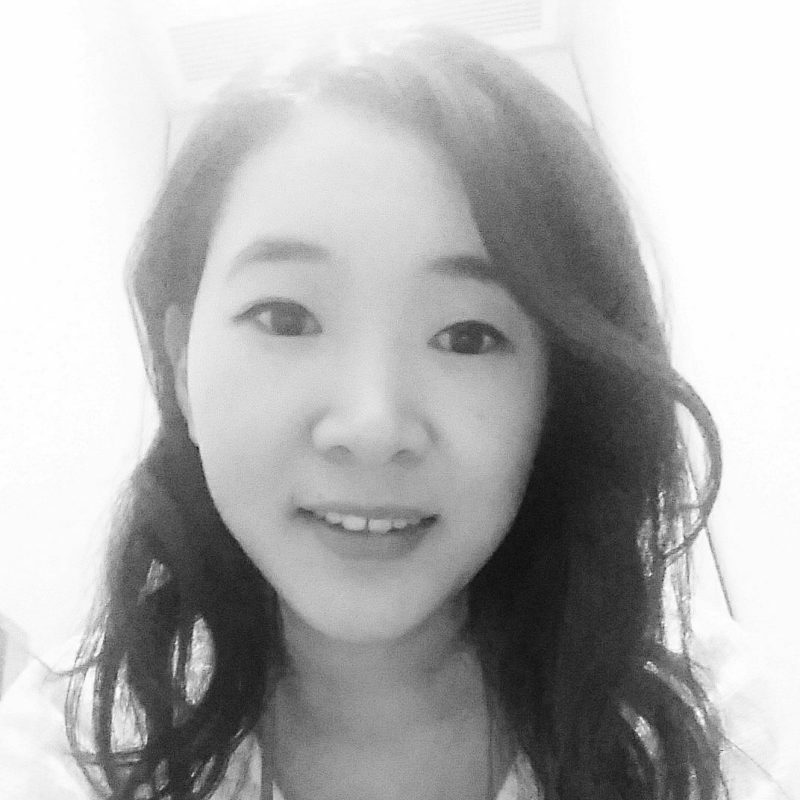 I really like both products in the Jeju Lava Seawater line because they feel very hydrating while also being lightweight. They’re not the most potent anti-ageing products on the market but they’re decent enough if you’re just looking for preventative skincare rather than treating existing signs of ageing. 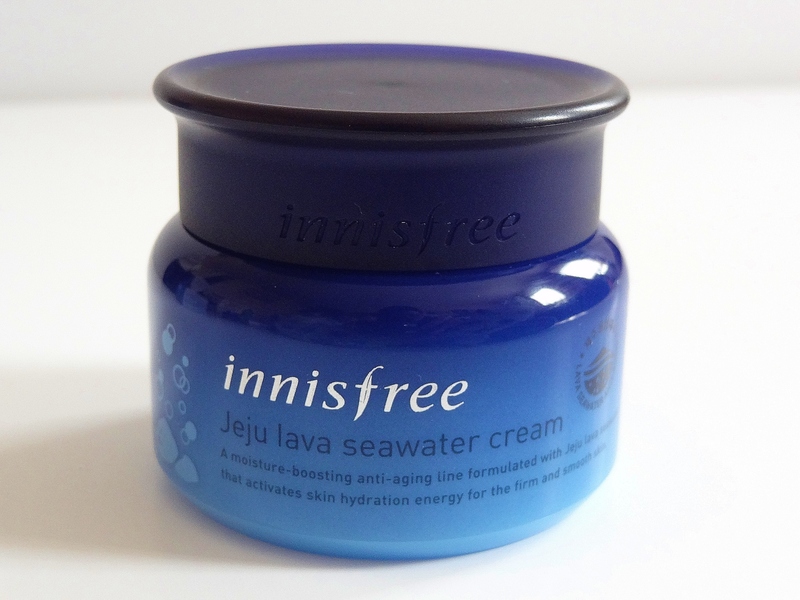 For me, its another hit from Innisfree and I would try out more products from this line. Previous Post Skincare Empties 2016! Next Post [Early Christmas] KoreanBuddy haul! 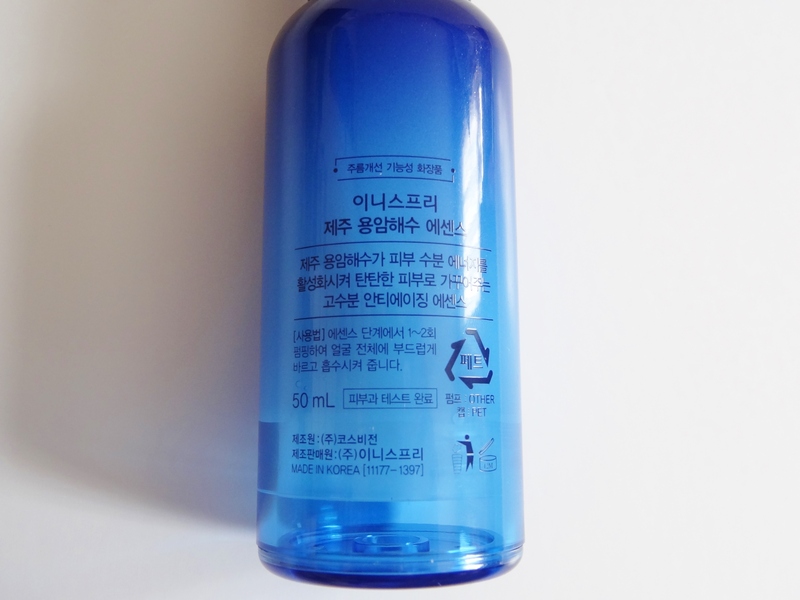 I just tried the 1st time and my skin is reacting a bit and im worrying if this product is not anti allergic. Hi sorry for the late reply! 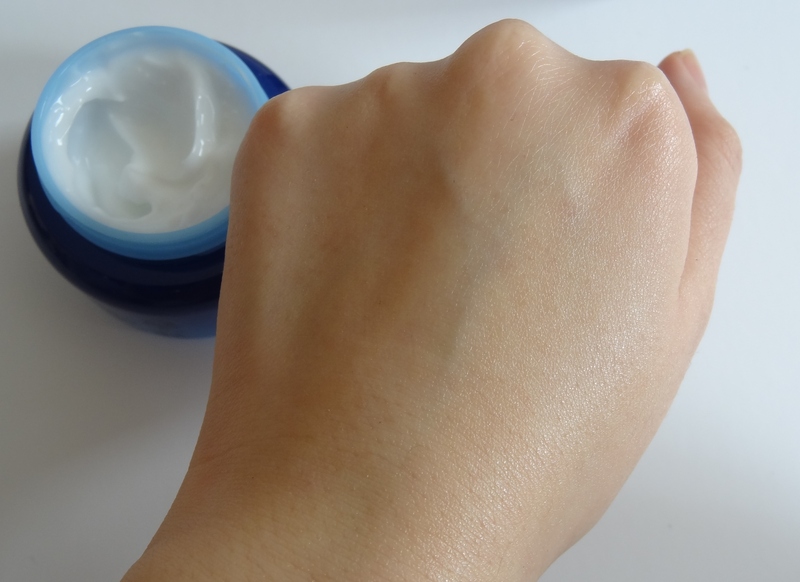 Neither cream irritated my skin at all, I find them to be very gentle although if you are sensitive to fragrance then you might want to consider that. I would recommend this one over the green tea because the texture and lightweight consistency felt more comfortable on the oily parts of my face and it doesn’t feel heavy at all.